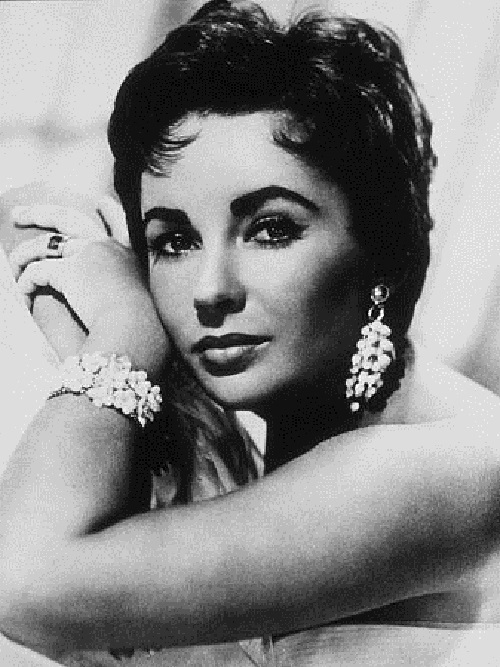 Elizabeth Taylor once told reporters: “My mother told me that I did not open my eyes for eight days after I was born, but when I did, the first thing I saw was an engagement ring.” 269 ​​items of jewelry of Elizabeth Taylor, were indulgence of lovely Hollywood Star. 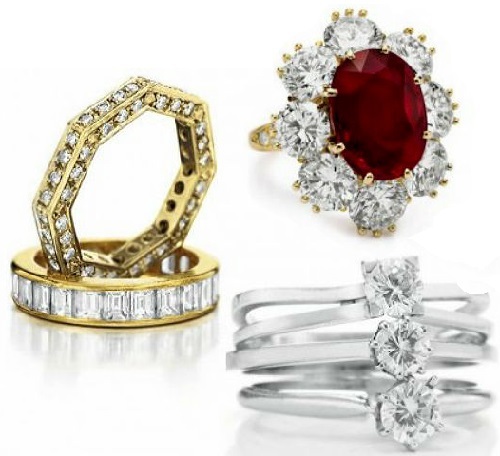 Historic, iconic, legendary and even epochal – these are just some of the words that can describe this impressive collection delighting audience – diamonds, emeralds and rubies, not to mention the historically significant pearl. 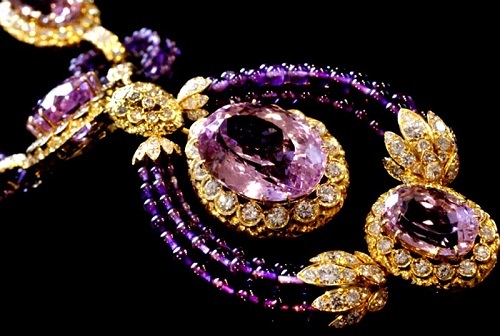 These ornaments are rich both in number of carats, and the stories of intrigue, passion, whims, fads, indulging their own lusts, desperation and love. 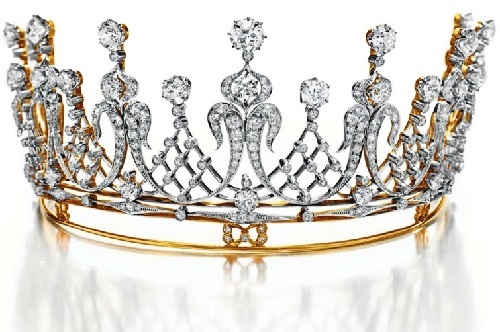 $ 20 million for the jewels of the legendary Liz. However, during the auction, later called the most extraordinary, showed more love and respect of the fans to the actress, the mark of $ 20 million has been overcome almost 6 times. 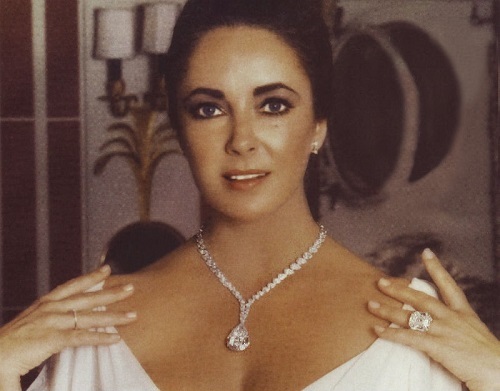 Jewelry of Elizabeth Taylor was sold for $ 116 million. 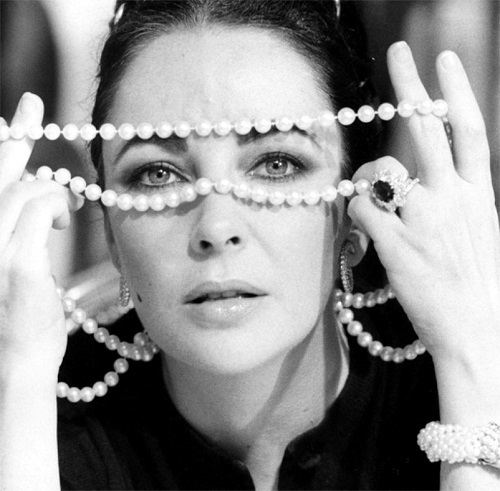 In 2002, Liz said: “I hope the presence of magic in my jewelry will be transferred to other people, to store and protect those who use them will have, because we are all the temporary custodians of beauty.” Taylor was able to be at once a diva, feminine and coquette, an elegant lady and a loving mother. Thus her collection is also unique. It really reminded her mistress: the same luxury and unsurpassed. 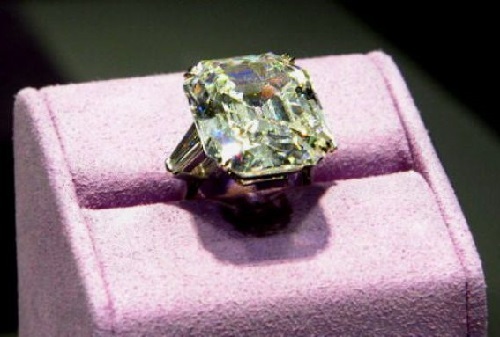 Diamond ring weighing 33.19 carats – a gift of Richard Burton, made May 16, 1968. 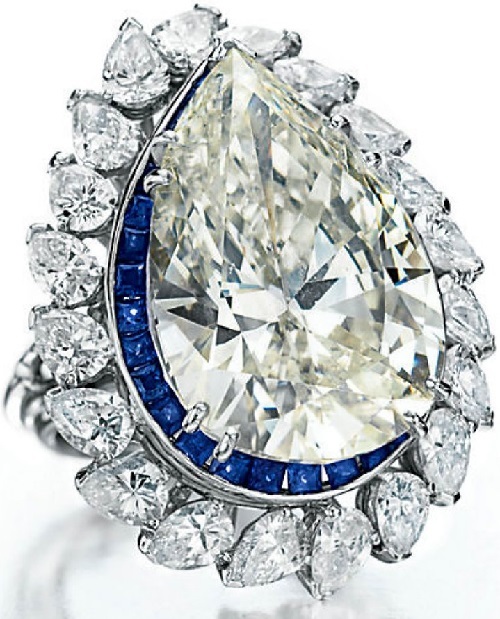 Considered one of the most iconic among favorite transparent diamonds of film diva, this spectacular stone has been an integral part of the life of Elizabeth Taylor, and flaunted on her finger almost every day. 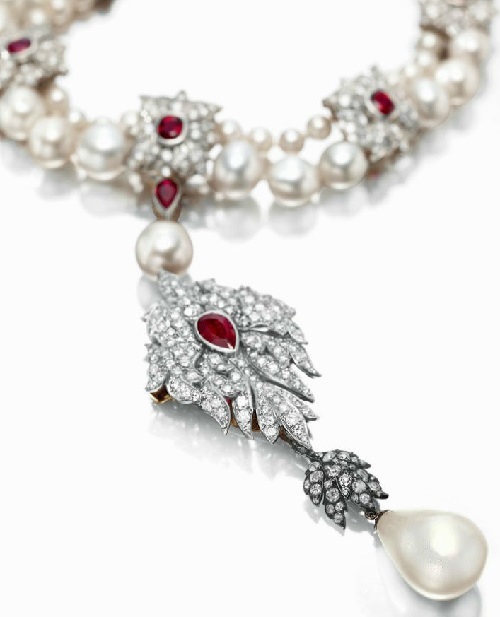 Peregrina – The Legendary “wandering pearl” necklace with a pearl of the XVI century, rubies and diamonds, the design coined by Elizabeth Taylor. Gift Richard Burton made January 23, 1969. ($ 2,000,000 – 3,000,000). This amazing pearl weighing 203 grains, or 55 carat, is considered one of the most significant in the history of pearls. Found in the XVI century in the Gulf of Panama, this pear-shaped pearl has become part of the crown jewels of Spain. Spanish King Philip II is considered to be the first owner of the pearls. Then it passed to the Spanish queens Margarita and Isabel, who proudly posed for portraits in dresses that included Peregrina, even before the great Velasquez. 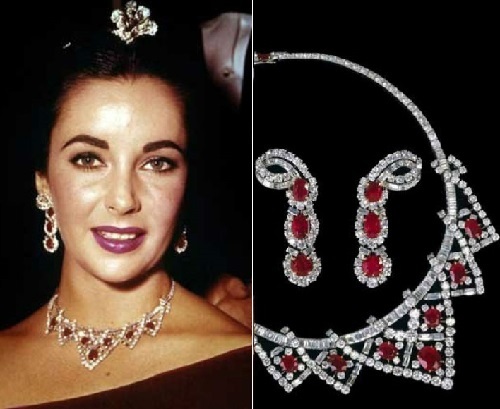 In 1969, the jewel was bought at auction for $ 37,000 for the Elizabeth Taylor, by Richard Burton, who managed to outbid a representative of the Spanish royal family. 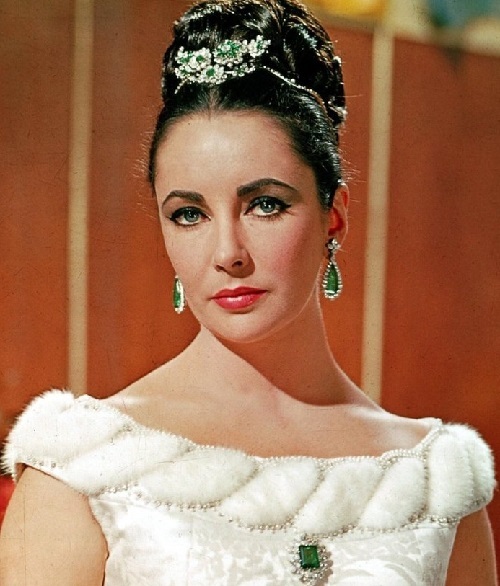 The actress sparkled in the tiara at the film award ceremony, “Oscar” in 1957, on which Todd’s film “Around the World in 80 Days” was recognized as “Best Film”. 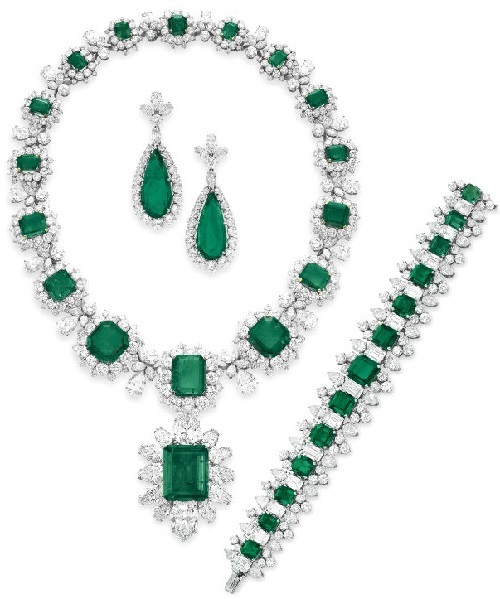 BVLGARI Necklace jewelry with emeralds and diamonds – gifts from Richard Burton made in the period from 1962 to 1967. Collected for a number of trips to the BVLGARI boutique on Via Condotti in Rome, these decorations create an incredible set, were a reminder of the favorite film “Cleopatra.” Richard Burton quipped following the time spent with Elizabeth in Rome: “I introduced Liz to beer and she introduced me to BVLGARI”. 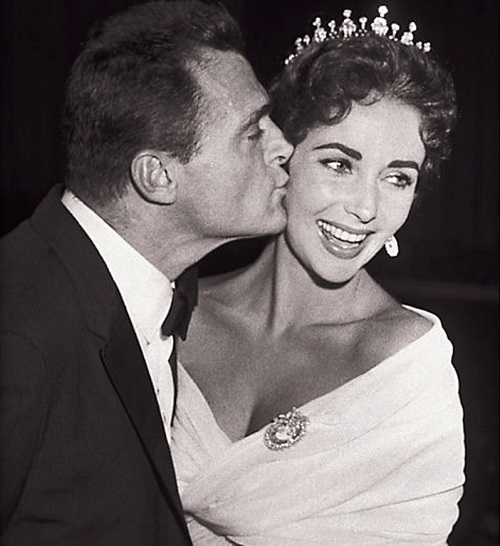 Being married to producer Mike Todd, Elizabeth Taylor once swam in the pool at their villa in Saint-Jean-Cap-Ferrat (France), when Mike suddenly gave her as a present – three boxes of Cartier, inside which was located decoration – amazing ruby ​​set. 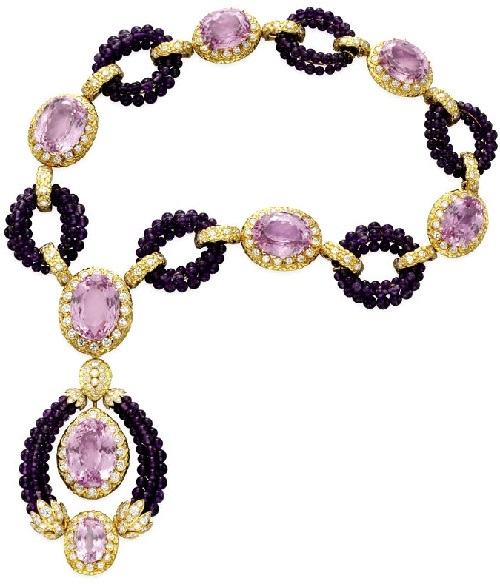 Sotuar with sapphires and diamonds from BVLGARI – a gift of Richard Burton, made in 1972. 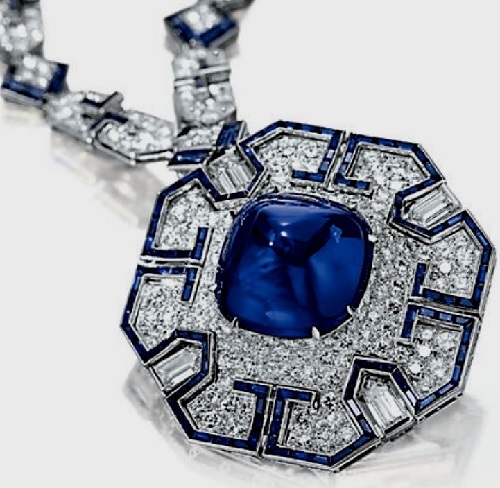 Set in an Art Deco style with a delicious cone-shaped sapphire cabochon weighing 52.72 carats, which was presented to Elizabeth Taylor by Richard Burton to her fortieth anniversary in 1972. Later she added the ring, creating a wonderful set. 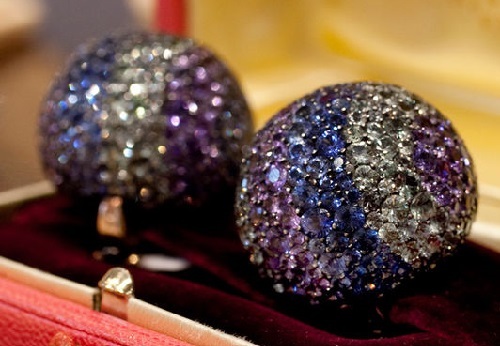 A pair of “ball” clips with diamonds and colored sapphires from JAR, bought in Paris in December 2001. This set of sapphire clips was made by the famous jewelry designer Joel Arthur Rosenthal (known by the initials JAR), who had a small boutique on the Place Vendome in Paris, which one could get in by appointment only. 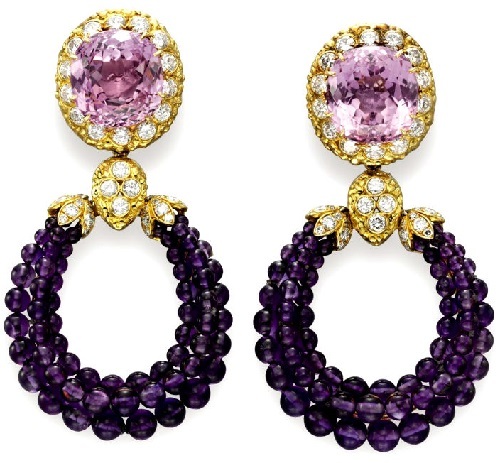 To produce these special earrings, JAR used sapphires of different shades to convey subtle shade of Elizabeth Taylor’s eyes. Joel Rosenthal remembers: “She told me that her blue eyes, like mine, sometimes look green, and even purple.” Thus, striped clips reflect the color of her eyes. 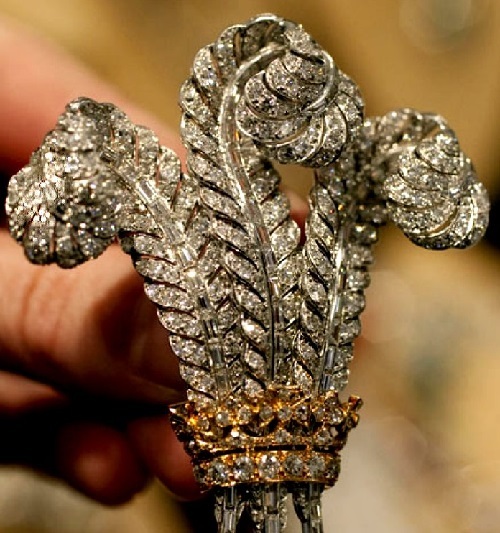 Prince of Wales Brooch with diamonds, made around 1935, from the collection of jewelry of Duchess of Windsor, which Elizabeth Taylor bought at an auction in April 1987. Previously owned by the Duchess of Windsor, this sparkling diamond brooch in the form of three feathers (emblem of the Prince of Wales), was previously donated by the Duke of Windsor to his wife. 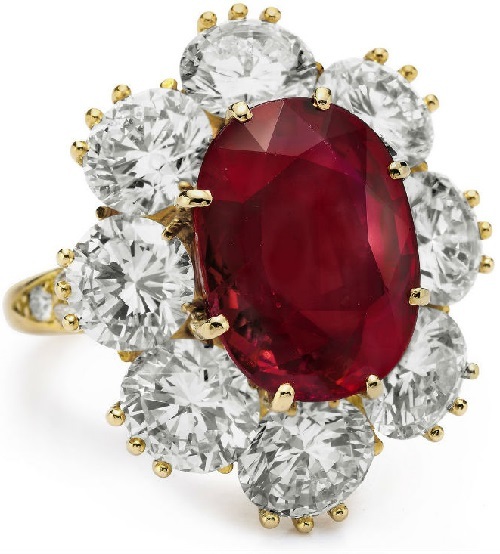 Brilliant “Taj Mahal” (about 1627-1628) on a gold chain with rubies by Cartier – a gift of Richard Burton to Elizabeth Taylor’s fortieth anniversary in 1972. 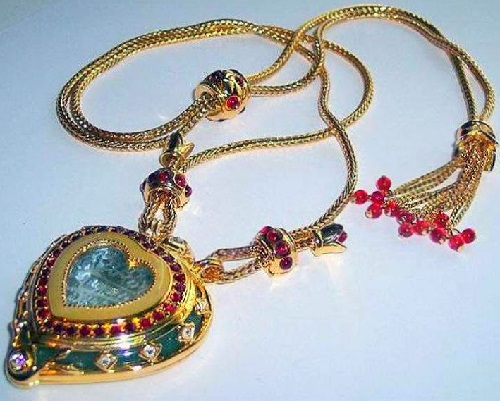 Dedicated to the name of Nur Jahan, the wife of the ruler of the Mughal Emperor Shah Jahangir, a heart-shaped diamond is considered to be a gift to the son of the ruler, who became the great emperor to his most beloved wife – Mumtaz Mahal. The sadness of the emperor after the death of Mumtaz Mahal four years later became legendary – in memory of the wife, Shah Jahan ordered the construction of a grand Taj Mahal – one of the new seven wonders of the world. Necklace by Edith Head. 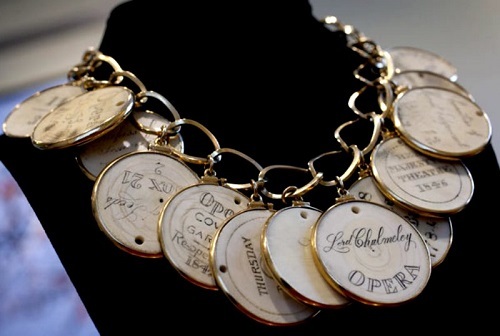 Gold and ivory necklace with passes to the opera made about the XVIII and XIX centuries – a gift from Edith Head. Made of theater ivory tokens is a unique necklace owned by Hollywood costume designer Edith Head, a close friend of Elizabeth Taylor, her “second mother” according to the movie diva. As later recalled Taylor, she has always admired this necklace of Edith, who, in turn, promised to bequeath it to Elizabeth. 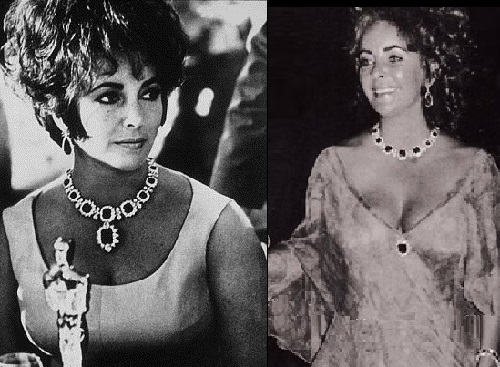 She kept her word – the necklace was the only thing that has been bequeathed to Elizabeth, and it became an expensive reminder of an old friend and one of the most popular jewelry of Elizabeth Taylor. 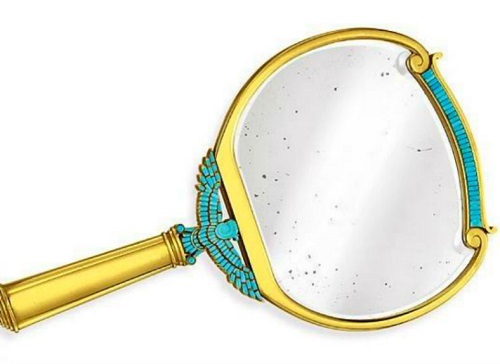 ‘Cleopatra Mirror’ – gold and turquoise mirror from BVLGARI. The mirror in the ancient Egyptian style, which BVLGARI created in 1962, just in time for the shooting of the epic film “Cleopatra” in Rome with Richard Burton and Elizabeth Taylor in the lead roles. 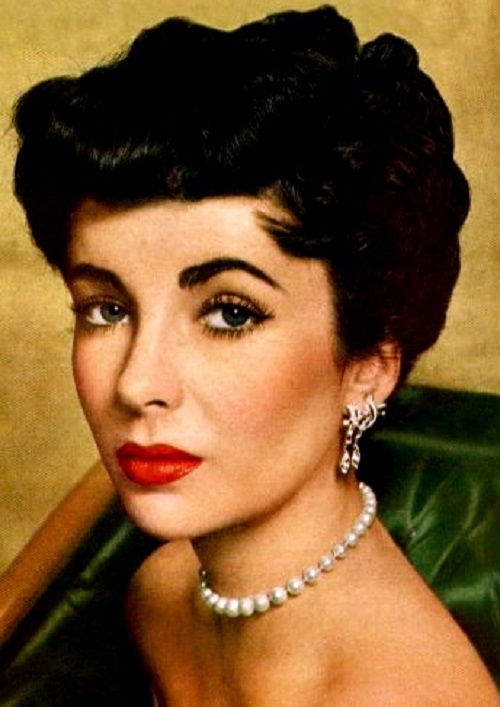 This is an exciting product from gold and turquoise is one of the unique items in the collection of the legendary Elizabeth Taylor. Of course, in one publication is not possible to fit the description of all the famous jewels of the Queen of Hollywood. She adored jewelry, and did not leave it until the last minute of her life.